Beautiful specimen certificate from the Douglas Aircraft Company, Inc printed in 1966. This historic document was printed by the American Bank Note Company and has an ornate border around it with a vignette of two angels flanking the earth. This item has the printed signatures of the Company's President, Donald W. Douglas, Jr. and Secretary, and is over 48 years old. Founded in 1920 by Donald Douglas, Sr., the name Douglas is synonomous with aircraft development. The first aircraft produced by the company, The Cloudstar was funded by David R. Davis, a wealthy sportsman. The aircraft was designed to fly non-stop coast-to-coast, did not complete the flight but was the first aircraft to lift a load exceeding its own weight. It ultimately became the flagship of Claude Ryan's San Diego-to-Los Angeles airline. Davis lost interest and sold out to Douglas, who incorporated The Douglas Company in July 1921. He finally landed his own Navy contract-to build torpedo bombers, starting with the DT-1 (Douglas Torpedo, First). By 1922, the company had delivered six aircraft for $130,890. Douglas leased the abandoned buildings of the Herman Film Corporation at 2345 Wilshire Boulevard in Santa Monica, California, where he built the Douglas World Cruiser. By the fall of 1928, the company was worth $25 million. Despite the 1929 crash that started the Great Depression, Douglas kept his company alive and financially sound building military aircraft. In 1932, he started building the DC-1 and launched his career as a builder of transports. By 1940, sales of DC-2 and DC-3 transports and their military derivatives rose to nearly $61 million. To keep up with World War II production, Douglas built plants at Long Beach and El Segundo, California, and leased facilities in Chicago, Oklahoma City and Tulsa, Oklahoma. The leased plants were closed at the end of the war, but Douglas continued to produce commercial and military transports, jet fighters, missiles and rockets. Donald Wills Douglas Sr. was company president until 1957, when his son, Donald Douglas Jr., took over that position. Donald Douglas Sr. remained chairman of the board. 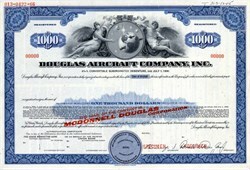 At the age of 75, on April 28, 1967, Douglas merged his company with the McDonnell Aircraft Company and retired. He remained honorary chairman of the McDonnell Douglas board until his death on Feb. 1, 1981. A rare certificate related to one of aviation's most important companies. Uncancelled and Extremely Fine.